Are you the heroic person who can save Merlo’s life? Donors are urgently needed! 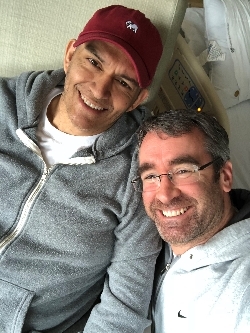 We are seeking a match for Merlo Weiss, a Hispanic-American father recently diagnosed with Acute Myeloid Leukemia, an aggressive form of bone marrow cancer. 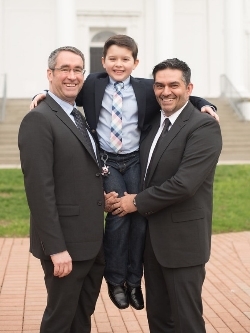 Merlo and his husband David are the parents of a 9-year-old boy, and residents of New Jersey. Merlo’s doctors have recommended a stem cell or bone marrow transplant to save his life. There is currently no matching donor for Merlo in his family or in the worldwide registry – although we believe one is out there and it could be you! Matches are based on factors that are inherited like hair and eye color, so ancestry is often a good predictor. Merlo’s matching donor may be Chilean, Latino or Hispanic. Joining the registry only takes a quick cheek swab. Order your kit now or visit any donor drive being held by Gift of Life near your location. Note: If you live outside the United States, you must register with your country’s bone marrow registry. Your matching information will be entered in the worldwide registry and Merlo’s doctors will be notified if you are his match. Merlo was born in Santiago, Chile, and came to the United States with his parents as a child. He was raised in Miami, Fla., then in his early 20s moved to New York City to pursue his career as a producer for major events. His productions include The Makeup Show, the largest annual professional makeup conference in the United States. 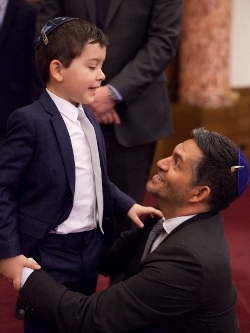 He is an avid tennis player, loves traveling the world with his family and is active in his synagogue. But what he is most enthusiastic and excited about in life is being a highly involved father for his son and uncle to his little niece. Merlo recently chose to take a hiatus from his career to spend more time with the children and volunteer at his son’s elementary school. I need your attention and collaboration. Read this statement on behalf of my whole family and help me share it: Let me introduce Merlo Weiss, my cousin, a Chilean-American. He is a father, husband, vigorous traveler, a great tennis player, good son, good brother and a beautiful human being. At this moment he is fighting a gigantic battle for his life since he was diagnosed with cancer of the bone marrow, and this has turned out to be very invasive. Every day and every second counts, because his illness advances and he has not found a [marrow] donor that can help him. His brothers turned out not to be compatible. For this reason I appeal to the love you all feel for our family, our shared experiences and connections, to give us your help by getting a swab test to see if you can help him. Our Merlo’s life is at stake, and we can only ask for your support so that you can save him with your valuable act of love. Read the full text of Viviana’s post on the Match4Merlo donor circle page. Join the registry: Please swab your cheek and join the registry as soon as possible! Hispanic backgrounds are encouraged to participate. YOU may be Merlo's perfect match! Order your swab kit at www.gol.org/Match4Merlo or join the registry at any donor drive. Find a drive near you. Sponsor donor swab kits: Processing each volunteer donor’s swab kit to identify if they are a match costs $60. Sponsor a swab kit to help us tissue type new donors. Share Merlo's story: There are over 50 million Hispanics in the in United States alone, and someone out there is Merlo's lifesaver. Help us find him or her by sharing this story. What’s involved in donating stem cells or marrow? Donating stem cells is similar to donating platelets: blood is drawn from one arm, stem cells are collected, and the remaining blood is returned in the other arm. You can watch a movie, chat with friends, or take a nap while donating. Bone marrow donation is a 1.5 hour outpatient procedure done under general anesthesia where marrow is collected from the hip bone with a syringe. Bone marrow and stem cells regenerate naturally. Learn more about being a donor. Your personal information is rigorously protected by both HIPAA regulations and Gift of Life’s security measures.